When we think of apps for kids, we often think of games for either entertainment or learning. But apps aren't limited to just games or books -- apps can provide important social, emotional, and physical experiences too. 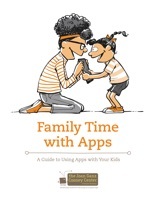 This iBook is designed to help parents better understand the variety of ways that apps can support children's healthy development and family learning, communication, and connection. The guide aims to show parents how to find the best apps that fit your child’s needs, provide tips on how (and why!) to use apps together, and highlight even more resources that will make the process of selecting apps less overwhelming, and more fun.